So sorry you had to go through that alone. You have lots of good memories of Ziggy - keep them in your heart. T.
What a beautiful boy. I love the story about the mousie game. What characters the kitties are...even if they can wear us out. I'm glad that you were with him when he passed. I think that would be better than finding him all alone and be upset that he went without your love wrapped around him. Take care of yourself. (Just had some 'shocking' news a few minutes ago...the boys (Gabe and Noah) 'aren't working out'.. Phew. People. So eight cats in the house? Any suggestions or tips to help things not be a trainwreck would be appreciated. We heard from Miss Peach about your loss. We're very sorry to hear that Ziggy had to go the Bridge. He sounds like a wonderful cat and you loved each other very much. we are sorry to hear about your sweet boy Ziggy. What a lucky boy to have had so much love from you all, and to have waited for you to be by his side as he passed. We heard of your loss of your dear sweet, Ziggy from Misses Peach. We came here to tell you how sorry we are for your loss. Take peace in knowing that he left you knowing the TRUE meaning of love, family, and home. He will always watch over you from the bridge and will anxiously be awaiting the day you are together again. Mark, Laura and I are so sorry to hear about Ziggy. He was certainly a character! It seems that the cats who adopt you are the hardest ones to lose. I know you and Ralph did your very best by Ziggy. He got the best of care. No one could have done more. We are so sorry to learn about Ziggy. He was obviously quite a light in your life. We just recently lost our Crystal, so we know how painful it is to say good-bye to a beloved furry. Warm purrs and tail wags. We heard of your sad loss from our friend Miss Peach. Ziggy sounds like he was a wonderful cat and a terrific friend. Although you are missing him so much today, be comforted to know he will live always in your heart. We are so very sorry to learn of the passing of beautiful Ziggy. Your tribute to him shows what a beloved friend he was to your family and also what a great character he was. We know how hard it is to lose an old feline friend. Ziggy had a wonderful life with you. He will be watching over you all, thankful of the great life and love you gave him. My sisters and I are so very, very sorry to hear about your sweet Ziggy. Unfortunately we didn't have a chance to get to know him, but your heart felt tribute left us feeling that we had known him forever. Thanks so much for sharing him with everyone and will can all remember Ziggy forever. Our best loving purrs to you. We know what you mean. Despite not having nearly enough time with them we would gladly do it all over again for our "special" ones. We hope that the happy memories take over faster than Ziggy's passing. Kathy, I am so, so sorry. It was difficult to read your entire post through my tears. A big cyber hug to you all. We read about Ziggy on Misses Peaches blog and wanted to come by and send you some comforting purrs and prayers. We went through this not long ago and we know how sad you must be. But just remember that Ziggy is at the bridge, and healthy and not sick anymore. I am so sorry. We are sending you are purrs and prayers for comfort. At least he is not in anymore pain and is running free with all the othe rainbow bridge kitties, including my Rodzilla, Lady Harley and Shrek. I know they are all taking care and loving each other. Our purrs and prayers are with you. I just read of your loss at the CB and I wanted to offer my deepest purrs of sympathy to your family. So sorry for your loss. I saw this on FB this morning and am so sorry. Reading your chronicle tonight through tears, Charlie came over and annoyed me by trying to be on my laptop, or tried to annoy me. I've never been so happy to have him annoy me in this way. Ziggy will be Tina's Neelix to you. I've never missed a dog the way I miss the cats that have passed through my life. Cats have a way. I am so very sorry for your loss of Ziggy. I hope that the memories of his wonderful life with you will be of comfort to you as you miss him. We are so sorry to hear about Ziggy. All we can offer are our purrs of comfort. We know how hard this parting is. We are sure our own LC and Skeeter were there to greet Ziggy at the Bridge and show him around in the new place. Ziggy would be impressed - 24 comments already. I think Mom really appreciates your kind words. We're all so very sorry to hear about poor Ziggy... A lot of us here know exactly what you're going through right now, and we know it's so hard. The softest purrs to you and your family. We are so sorry to hear about Ziggy. He sounds like he was a terrific cat. Love the fact that he would fetch his toy. And he was so persistent about living in the house. It is so hard to lose an animal. Lots of purrs coming your way and woofs too. Big hugs to you and we'll light a candle here for Ziggy. I know how hard it is to lose those much loved companions. I'm sure he's back at his mousie game now though. Mom and me are so sad to hear about Ziggy's passing. Mom says he sounds like he was the bestest kitty. Purrs and hugs from us to you. We're so sorry to hear of Ziggy's passing. Our Ziggy especially is sad to hear about the namesake he never knew was out there. Your Ziggy sounds like he was a very wonderful kitty. We bet our Callie, who we lost in December, was there to greet him at the Bridge. We're sending many purrrrrrrrs to you right now. Sending you much healing and comfort during this time. I hope Ziggy is enjoying all the mice on the other side. May you always remember him with a smile for the times you shared. Oh bless you for your love to Ziggy! And for your open heart to all critters, and your faith to do it again! My heart is with you in your sorrow and I pray for your healing...I know of what you speak as we lost one of our own precious cats this fall. They are truly gifts in our lives. I haven't read your blog before, but I am moved by your postings on Ziggy! I'm sorry to hear of Ziggy's passing and how it pains your heart. Zig was a good friend to you, and you to him. I've had animal friends go to the Bridge, too, and it's always sorrowful. 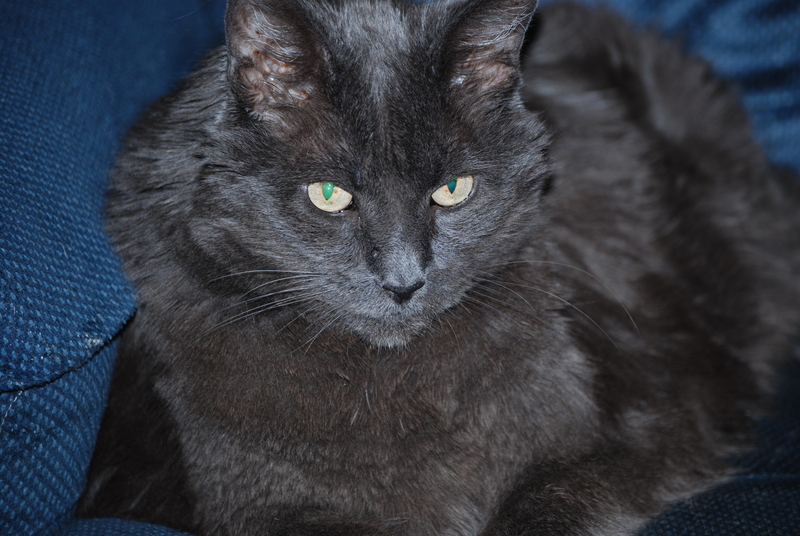 Hugs and Purrs to you...and we'll always remember Ziggy.. I am seriously sorry for your loss. We lost our cat of 16.5 years last November and we will miss him. At least you got to be with him up until the end and he got to be at home when he died. I'll be thinking about you. You are not alone in your sadness. You have shared this wonderful story with us, and now we are here to hold you up. I am pretty sure Caesar and Princess were there at the bridge with open paws welcoming Ziggy to eternal comfort and rest. Oh, my, we are soo furry sorry to heer dis terrible sad mews. We knows how hard it iz to lose a speshul furriend. We iz sending tons of healing purrs to soothe your greef, an we know Ziggy will find lots of furriends, and not be hurtin anymore offurr da bridge. Purrlease know that he lives on in your precious memories of your wonnerful years together. We are so very sorry for the loss of Ziggy. It sounds like he was a wonderful cat, and we are glad you had so many wonderful years with him. We are also glad you were with him as he passed.....what more can we do, or can a pet ask for? We will be purring and praying for all of you. We're so sorry to hear that Ziggy had to go to The Bridge. Please know that we're purring and purraying for you. Codspeed dear Ziggy, Codspeed. I've come over from Miss Peach's. Ziggy looks like a wonderful cat. What a gorgeous, thick, rich coat he had! I know what it is like to lose one as I had to let their litter-mate go a few years ago. Sometimes I still shed a tear for her. Some people said to me, "It's only a cat!" but they don't know, do they? There is such a deep connection with a loving fur-companion. There is such a knowing behind those eyes. In time, when you think of him, it will be with more smiles than tears. Till then, and in the weeks ahead, be especially gentle on yourself. Give yourself all the time, love, sleep and treats that Ziggy would have wished you. We are so sorry to hear about Ziggy going to the bridge. We know how difficult it must be for you at this time. You are in our thoughts and prayers. I am so very sorry to hear of Ziggy's passing, I know how sad you must be. I also know you will in time remember more the wonderful times, the fun times, the loving times. He is surely remembering them too. Love and strength to you now. Dear Kathy and family....I am thinking about you and wanted you to know. You have been loved on so much and that is wonderful. My friend Helena is mommy to Princess Dilly...who I adore so much. Dilly left you the best comment on my blog about Ziggy...it is purrrrfect and precious...like the love of a loyal kitty all ones life. I am so glad that you had Ziggy in your life and I am sorry that he is now gone. Thank you for sharing his story and your love for him. Give yourself the gift of time to grieve. We are very sorry to hear of your loss. We wish for your hart a recovery, and for your head long memories. As I'm wiping tears away, my heart feels for you. I'm sorry for your loss, we too have lost many a beloved animal and it hurts deeply. Hugs to you, prayers to both you and Ziggy.